DEFINIENS Tissue Studio 3.5 now supports automatic analysis of in situ hybridisation assays, including SISH, CISH, FISH and dual-ISH, the company reports. The software facilitates the detection of spot-like signals from gene probes, or other stain with spot-like appearance, on a cell-by-cell basis, working in both brightfield and immunofluorescence imaging. Tissue Studio will analyse any solid tissue images acquired by any scanner or microscope, says Definiens, enabling pathologists and researchers to adapt to their specific assays in a few minutes. The company says that Tissue Studio significantly reduces study times in translational research, preclinical safety, tissue-based biomarker development, and clinical trials. The new version includes a range of improvements intended to make it easier to use and more powerful than ever. 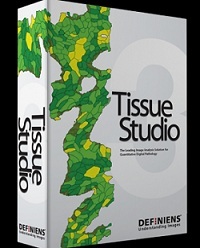 “In Tissue Studio 3.5, we make available to our customers a very easy-to-use workflow that supports virtually any type of 2D ISH assay” said Thomas Heydler, CEO of Definiens. The software automates the detection of regions of interest, and has the capacity to distinguish individual cells and subcellular structures even in heterogeneous tissues samples. It provides quantitative readouts on morphological characteristics and molecular expression profiles of nuclear, cytoplasmic and membrane biomarkers. It also supports robust detection of vessels for automated angiogenesis assays, and multiplexing for the quantification of many parameters from the same tissue sample in immunofluorescence assays, says the company.